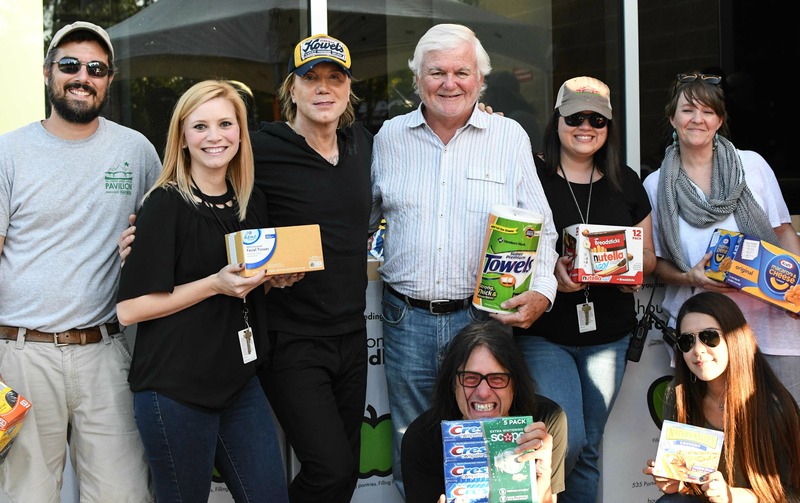 The Woodlands, Texas – Multi-platinum, Grammy-nominated band Goo Goo Dolls and Phillip Phillips assisted Pavilion staff members with the collection of thousands of needed items at a special donation drive held before the band’s concert September 7. Concertgoers were encouraged to bring non-perishable donation items to the show to help support Hurricane Harvey relief efforts. The band, along with Phillip Phillips, helped collect donations and took the time to personally thank the Texas community members for their resilience during this terrible tragedy. All donations, along with 100% of merchandise sales for the night, will go to the Houston Food Bank. Additionally, The Pavilion and the band granted free entrance into the show for first responders and their families. If you would like more information about The Pavilion, please visit www.woodlandscenter.org. Look for The Pavilion on Facebook, Twitter, Snapchat, YouTube and Instagram, or download The Pavilion’s iOS or Android app.